July 30, 2018, 10:26 a.m. The recently announced hosepipe ban in the North West (United Utilities) is the first in England and Wales since 2012, when two years of low rainfall led to widespread water use restrictions including hosepipe bans. YouGov Custom research indicates that Britons are less likely now than in 2012 to blame the actions of water companies and more likely to focus on climate change. 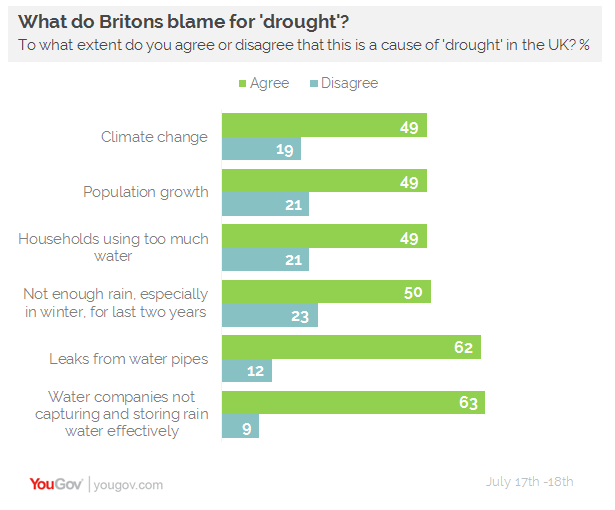 YouGov asked about the causes of drought in the UK. Close to half (49%) said climate change is responsible, up from 38% in 2012. The same percentage (49%) attributed the problem to population growth. Over six in ten (63%) say that water companies have not captured and stored water effectively, down from 76% in 2012. Similarly, 62% blame leaks from water pipes, down from 77% six years ago. Half (50%) said they felt that not enough rain, especially in winter, over the last year or two is a contributing factor, just 23% disagreed. Added to this, a similar number (49%) believed that households are using too much water. Interestingly, this number has not changed this 2012. Just one in five (22%) believe that their water company is doing enough to help people use less water, 31% say they are not, while 30% neither agree nor disagree. Similarly, just 23% think water companies are doing enough to fix leaks, and 23% believe they’re failing to capture and manage water resources effectively. On a more positive note, 61% say that their water company is doing enough to provide a reliable supply of water to households, just 10% disagree. Compared to 2012, more people are now giving more thought to their own water usage (48% now, vs. 39%). Four in ten (41%) are using less than usual, against 32% six years ago. This is especially true of older people (55% of those aged 65+, compared to just 29% of 18-24s.